For the third year in a row, demonstrators gathered in the nation's capital and cities around the world for Women's March events. In Washington, D.C., crowds of people wearing pink hats marched from Freedom Plaza down Pennsylvania Avenue, advocating for women, immigrants, people of color and LGBTQ rights. They took to the streets just weeks after women were sworn into Congress in record numbers. Marches took place nationwide from New York to San Francisco to Dallas, Philadelphia and Portland, Maine. Crowds in Montpelier, Vt., braved temperatures well below freezing. In Seneca Falls, N.Y., the seat of the first women's convention in the 19th century, marchers in big coats trudged through falling snow. Red-and-white outfits inspired by the dystopian novel and television series The Handmaid's Tale, popped up in marches across the country, similar to last year's demonstrations. In Pennsylvania, Attorney General Josh Shapiro introduced a survivor of clergy sexual abuse to speak. On a stage in New York, where issues of inclusivity have polarized marchers, newly elected Democratic congresswoman Alexandria Ocasio-Cortez rallied the crowd. The protest movement began in 2017 and still embodies many of the same ideas. But the message this year has been muddled by controversy among the leaders of the march. Ties between Tamika Mallory, one of the leaders of the march, and Louis Farrakhan, the leader of the Nation of Islam, have caused disagreement in the top ranks of the organization over Farrakhan's anti-Semitism. The Nation of Islam is considered a hate group by the Southern Poverty Law Center, and the Women's March has denounced anti-Semitism. The Democratic National Committee dropped its sponsorship of the march, as did the National Organization for Women, NPR's Danielle Kurtzleben reports from D.C. And the controversy led some women to stay home. Speakers, including Mallory, addressed the controversy directly and urged demonstrators to rally around shared causes. "To my Jewish sisters, do not let anyone tell you who I am," Mallory told the crowd. "I see all of you. I see you and I hear your pain." Even as the disagreement loomed over Saturday's proceedings, there was a sense of unity among the diverse coalition present, Kurtzleben reports. "I know there's some controversy around this march," Cristine Betters, who went to the march with her daughter, tells NPR. "But for us, it's not about the leaders. We don't know the leaders' names, we don't know anything about them, and we frankly don't care. ... We're here to be one with the sisterhood." Another woman at the march, who declined to give her full name, described herself as a Jewish feminist. 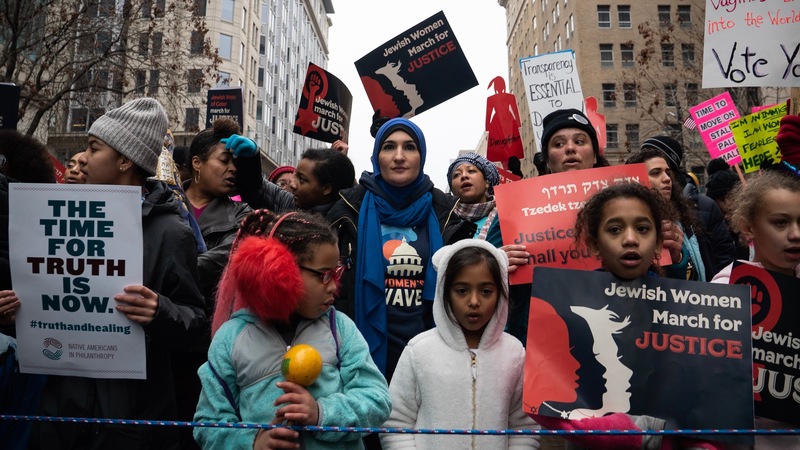 She had reconsidered attending the march because of the controversy but decided she would go in order to stand in solidarity with other women, NPR's Sarah McCammon reports. She held a sign in Hebrew that read: "And you shall love your neighbor as yourself." Marchers in Washington gathered in Freedom Plaza, unlike in the previous two demonstrations, which had taken place on the National Mall. But the march resembled previous years, as demonstrators raised signs about LGBTQ rights, #BlackLivesMatter and immigration, as well as myriad posters referencing President Trump. Meanwhile, a small group of protesters to the march held up anti-abortion and anti-Islam signs. The Women's March spread around the globe on Saturday, as it has in previous years, with demonstrators taking to the streets from Geneva to Madrid. In London, people gathered with signs protesting violence against women and policies of austerity.